ADVANCED CAR CARE SERVICE THAT COMES TO YOU! 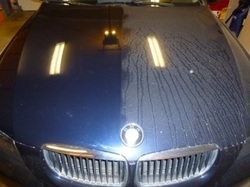 ecoShine Mobile Detail is the most convenient and environmentally friendly way to clean your vehicle. If you live/work in South Jersey or Philadelphia we will come to you and your vehicle! The concept was to get cars looking their best but do it in a way that was environmentally safe. This values-driven idea was a commitment to water conservation and natural resource protection. We use a unique line of eco-friendly products. Your vehicle's exterior gets hand-washed, hand-polished and is protected. The vehicle's interior is cleaned and UV ray protected without any slimy residue left behind. Our products are safe for you, your kids, and your pets! This car had been seriously neglected. It took just a minute using our basic application to restore this hood and reveal the shiny surface underneath all of that dirt and grime. See more before & after shots in our Gallery 1 page.